Someone’s Mum and Daddy Cooks Food have partnered with Schwartz to create simple but show-stopping recipes to make Christmas stress-free, easy and delicious. Frosty Christmas evenings were made for recipes to warm us up and get us feeling festive. They are for fires and blankets, good company and… our warming Butternut Squash Soup. 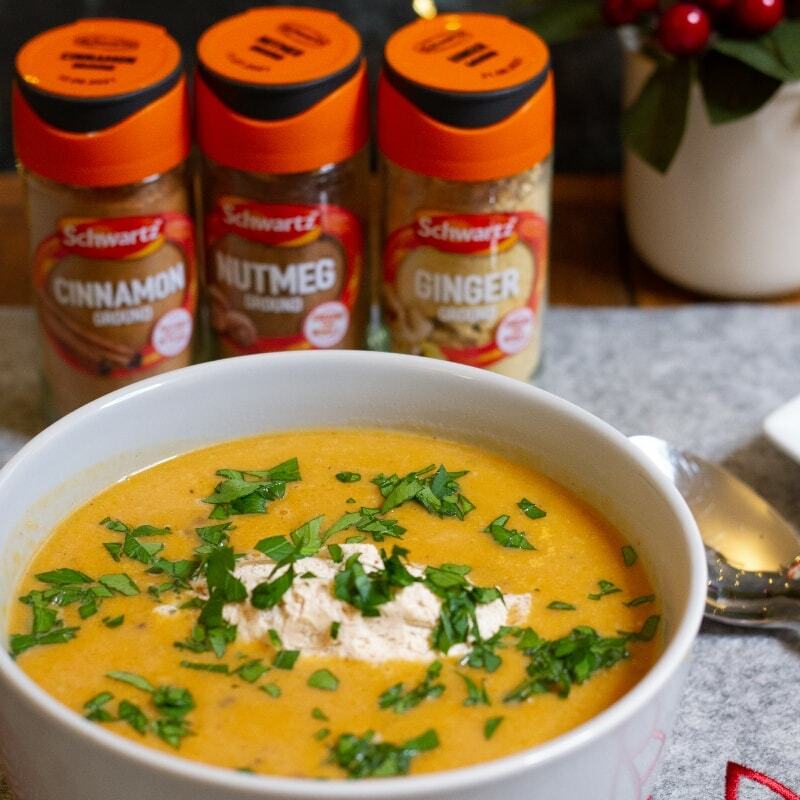 The Schwartz Cinnamon, Nutmeg and Ginger in this recipe perfectly compliment the sweet and wholesome flavour of the squash. 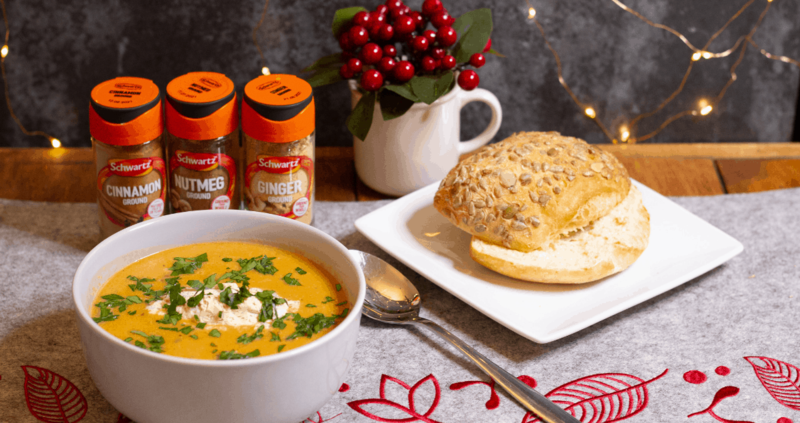 Add a liberal spoonful of Cinnamon Cream and you have the perfect winter warmer soup, just the thing for guests and cosy nights by the fire. For more of our Christmas collaborations with Schwartz, check out Daddy Cooks Food’s other recipes on their website and ours. Pre-heat the oven to 180ºC, 350ºF, Gas Mark 4. Whisk 145ml of the double cream until it forms soft peaks, stir in the Schwartz Cinnamon and leave to chill in the fridge. Peel and cube the squash and put it on a tray in the oven with the garlic, red onion and oil. Season and jumble together with your hands so everything is coated. Roast for about half an hour. Warm the stock until it is simmering gently, ready for when the vegetables are roasted. Carefully tip the squash, onion and garlic in to the stock. Add the butter, remaining 2 tbs of cream, and the Ginger and Nutmeg to the pan, then use a hand-held blender to make a smooth-ish puree. Season to taste. Pour in to bowls, then use two dessert spoons to scoop out quenelles of the Cinnamon cream and place them in the centre of the soup. Serve with a crusty roll. 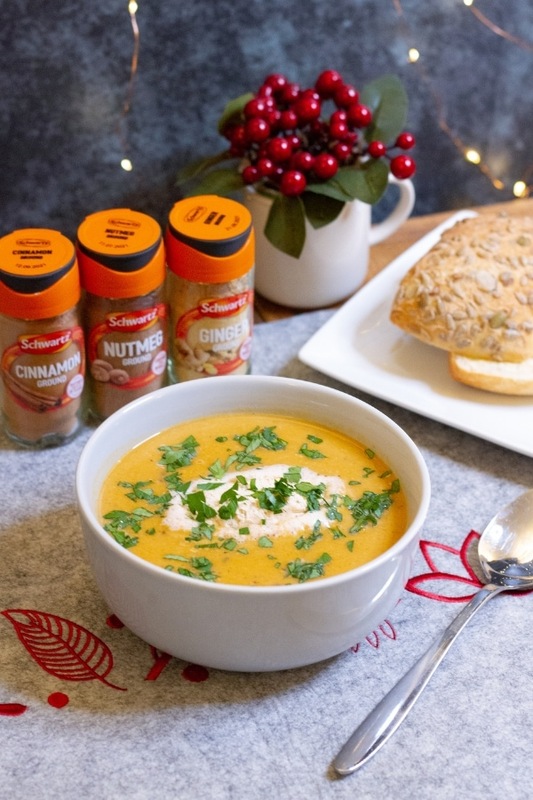 Not only would this soup make a lovely starter for Christmas day, it would also make a lovely spicy and warming meal after a carol service or Christmas shopping. It is just the thing to warm you up and get you feeling festive.